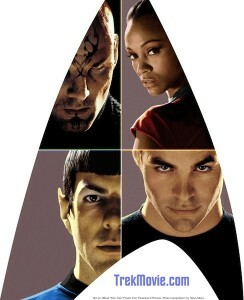 I love Star Trek. I used to be a proper, full blown, badge wearing, pointy eared Trekkie. Now I am one of those people who can, if the situation demands, cite episode number and obscure species name, without being obsessive. My first introduction to Star Trek was 'The Corbomite Maneuver' - the first episode of the 'original series' (well it was the first to be aired, the first episode was called 'The Cage' and Christopher Pike was the captain of USS Enterprise). We found that a wibbly wobbly alien was really a puppet being operated by the really ugly boy in Gentle Ben. That was first aired in 1966 on US television but I first watched in at the age of 12, in 1990, on UK television. I was hooked from that moment. I wanted to be an engineer like Mr Scott or a scientist like Mr Spock. The tasty property of red matter is that appears to make anything it touches collapse in on itself. This is why it can stop the expanding supernova blast wave.....really? Well, probably not. It would need to create an intense gravitational pull at the epicentre of the explosion, like a black hole, but since one of those has probably already been formed by the supernova itself (although it might only be a neutron star, depending on the mass of the star before it went bang), that is unlikely to help. Thats not the whole story either. During the film the naughty Romulan chap, called Nero (who is clearly a bit nutty, like his ancient Roman namesake, the Emperor Nero), squirts a bit of red matter at the planet Vulcan, which then obligingly collapses on itself. This I have no problem with (well, I do have a problem, but if the stuff does that in the script then I'm willing to go along with it). Mr Chekov then explains that he is forming a singularity in the core of the planet. Again, fair enough, Mr Nero went to all that trouble to drill a big hole through to the core of Vulcan to make sure the planet was destroyed symmetrically. He may be a bit mental but he does like his symmetry (look at all the pretty patterns on his face that he nicked from Rorschach). At the end, little Mr Spock (not to be confused with old crumbly Mr Spock) crashes a whole ship full of red matter into Mr Nero's squid-like ship. This is the part I am a bit grumpy about. This causes the ship to collapse in on itself, as you would expect. By Jove! This red matter is jolly stuff, you might say. But hang on a minute, as the USS Enterprise tries to escape it is trapped in the "gravitational pull of the singularity". This statement is not wrong in itself, but it is just plain impossible in this situation. Gravity is the attractive force between 2 objects with mass, and is directly proportional to the product of the masses (double the mass of one of them and the force doubles), and inversely proportional to the square of the distance between them (double the distance and the strength of the force is quartered). That basically is it. No magic. No "if one of the objects turns into a black hole then you get sucked in". So, what does this mean for Nero's squid-ship as turns into a black hole. The key number here is something called the Schwarzchild radius. This is the distance from a black hole (of any size) that you will be trapped by its gravitational attraction, never to escape (like an automatic lock-in on the Crystal Maze). Thats a distance but if you assume the black hole is not rotating you get the black hole at the centre of a mathematical bubble, where the distance from the black hole to the surface of the bubble is the Schwarzchild radius and the surface itself is called the Event Horizon. Beyond this surface you do not feel any adverse effects of the change, the object behaves exactly as if you were sitting next to a star, jelly, or star of exactly the same mass. No cosmic vacuum cleaner. Even if you pass through the event horizon you probably won't notice any change unless you try to escape, until you get really close to the black hole (when all sort of weird spagettification happens). Well, you might ask, surely the USS Enterprise was in a pickle because it had passed through the event horizon. A quick calculation will dispell that myth. With this simple formula you can work out the Schwarzchild radius for anything. For things without a crazily high density, the number is meaningless because it would inside the object (and then you can't use the total mass in the formula). You can now calculate the Schwartzchild radius for anything, and work out if you are in danger of being captured by fat people on the Tube if you get too close. Assuming that Nero's spaceship is about as big as Mount Everest (500,000 Kg) that would make the minimum safe distance roughly 10-21 m.
Sadly there is no way the USS Enterprise could be that close and cuddly to Nero's ship, because it is smaller than size of an atom. I suspect Mr Scott knew that all the long and was just playing along so Kirk thought he was a miracle worker. Those Brits are devious like that.